Quercus incana Roxb. ; Quercus oblongata D. Don. Note that this synonymy is not recognized by all authors (USDA, 2014; Govaerts et al., 1998). The banj oak (Quercus leucotrichophora A. Camus) is an evergreen oak tree of Asia, and particularly of the Central Himalayas. The bank oak grows to a height of 15-25 m (PFAF, 2014; Forestry Nepal, 2014). Banj oak has a full, rounded canopy. The bark is a smooth tan-brown at first, becoming lightly furrowed and corky with age. The leaves are alternate, elongated ovals with jagged teeth. 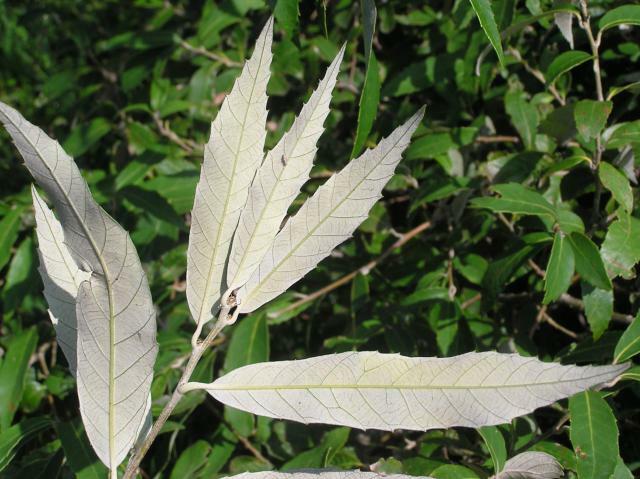 Young leaves are pink purple in colour and the upper surface turns deep green as it matures, while the lower side is silvery grey due to the presence of white hairs (hence the name leucotrichophora, meaning "which has white hairs"). The male inflorescences (catkins) are borne on the tips of the branches, while the tiny round female flowers are borne at the base of the leaves. The fruits are orange-tan, marble-sized acorns (L2G, 2014). The banj oak is a multipurpose tree. The acorns are edible and can be dried, ground and used to thicken stews or to make bread. The seeds can be roasted to prepare a coffee substitute (PFAF, 2014). The wood is a poor timber but a valuable fuel and is also used for making agricultural implements, and in low-grade construction. The galls that develop on the leaves are a natural source of gallic acid, a potential antitumoral/pro-oxidant agent (Patni et al., 2012). The gum from old trees is used in ethnomedicine for treating colds and as an analgesic (Gamble, 1922 cited by Forestry Nepal, 2014). In the Himalayas, banj oak foliage is a major source of fodder and the trees are lopped from December to June (Forestry Nepal, 2014). In the Mahakali Forest Division in Nepal, banj oaks represented 78% of privately owned forage trees (Hawkins et al., 1983 cited by Forestry Nepal, 2014). Banj oak is the most common broadleaf tree in the mid-elevations of the Central Himalayas in India. It is also found in Myanmar, Pakistan, Nepal, Thailand, and Vietnam. Quercus leucotrichophora is best adapted to regions with a mild and moist climate. In the Himalayas, the banj oak is found at altitudes between 1500 and 2400 m above sea level. It thrives on loamy and clayey soils but not on sandy acidic soils. It does better on soils with a pH ranging from neutral to basic (alkaline soils). Young trees do well under shade while older trees require more sunlight. The banj oak tree does better on moist soils (Forestry Nepal, 2014). It is tolerant of strong winds but not of maritime exposure. It is sensitive to fire, frost (-10° C is lethal) and browsing (PFAF, 2014). In Nepal, banj oak trees are lopped for fodder from December to June (Forestry Nepal, 2014). In areas where carbon sequestration is intended, banj oak trees can be cut for fodder only during March and April (McCall Skutsch, 2011). Banj oak trees coppice well until they reach a diameter of 25-30 cm, after which if coppicing occurs it is poor. It was shown that green foliage production was higher when the trees received N, P and farmyard manure. Intercultural operations such as weeding and hoeing had positive effects on foliage yield (Bisht et al., 2000b). 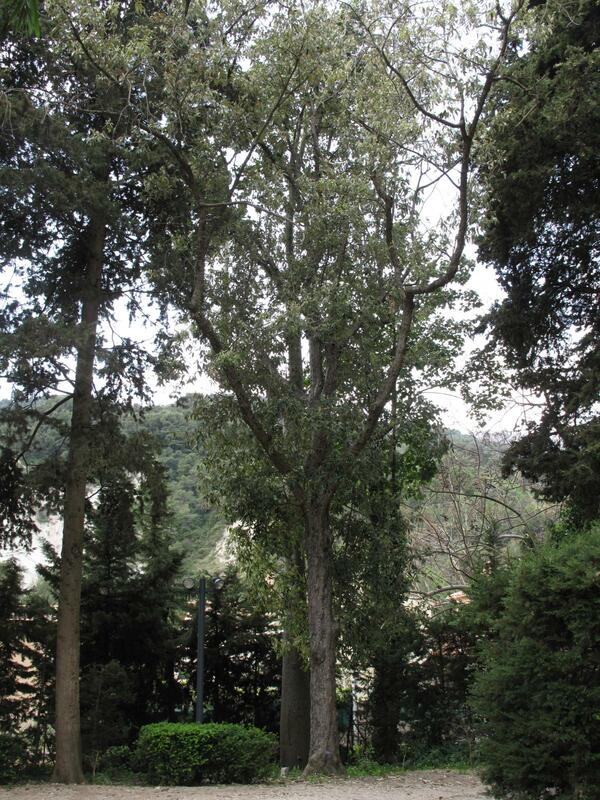 The banj oak is suitable for silvi-horticultural systems in the Himalayas. Growing turmeric (Curcuma longa) and ginger (Zingiber officinale) under a banj oak canopy resulted in the highest rhizome yields (39 to 122 t/ha for turmeric and 7.9 t/ha for ginger) and in the highest benefit:cost ratios (Bisht et al., 2004; Bisht et al., 2000a). The banj oak, with Acacia nilotica and the pine species Pinus roxburghii, have been successfully used for degraded mining land reclamation in the Indian Central Himalayas (Thakur, 2008). Growing banj oaks increased soil organic matter content of abandoned denuded land in the Garhwal Himalayas (Uniyal et al., 2003). Banj oaks are difficult to regenerate due to insect damage, human density and grazing pressure (Chaturvedi, 1995; Thadani et al., 1995). The higher than usual tree mortality observed in 2010-2011 in Uttarakand (Himalayas) was considered to be the result of several factors including pests (stem borer), climatic stresses (drought, frost), human and livestock pressure (Singh et al., 2012). 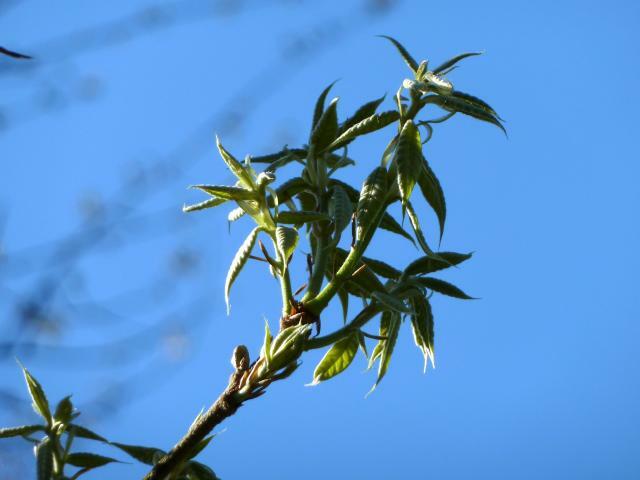 Banj oak foliage has a relatively low protein content (9-13% DM) and a very high fibre content: NDF is in the 60-70% range, ADF is in the 38-60% DM range and lignin, while extremely variable, can reach 20% DM or more. As noted in Potential constraints below, the foliage contains large amounts of tannins and condensed tannins (3-4% or more). The banj oak is one of the most tannin-rich forage tree of the Himalayas (Vir Singh et al., 1988). Its foliage contains high levels of tannins with a high protein-binding capacity (Singh et al., 2005). In ruminants, these tannins decrease diet palatability, feed intake and nutrient utilization (in particular protein utilization), resulting in lower performance (Makkar, 2003). Processing banj oak leaves by drying (sun-drying or oven-drying) or steaming was shown to be ineffectual for decreasing tannin content and alleviating their adverse effects (Makkar et al., 1991). 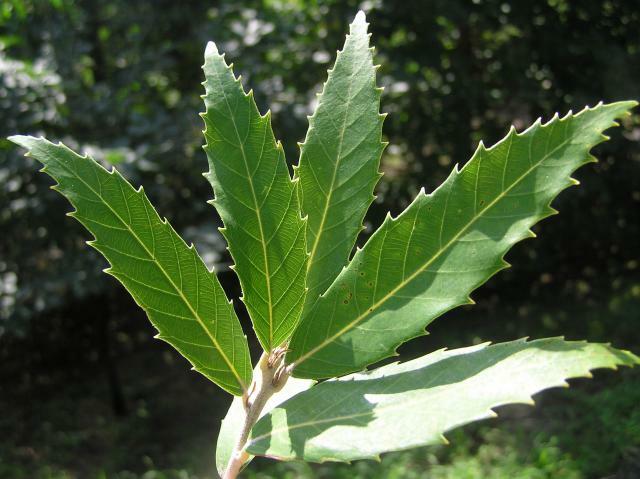 In India, a case of cattle poisoning by nephrotoxicity and hepatotoxicity consecutive to the feeding of immature banj oak leaves containing 9.7% tannins and 5.8% condensed tannins was reported. Mortality was 70% after the animals had exhibited anorexia, constipation and brisket oedema (Garg et al., 1992). Banj oak foliage is commonly used for fodder in the Himalayas. In the Garwhal region, farmers owning cows, buffaloes, sheep and goats, judged banj oak third after moru oak (Quercus floribunda) and kharsu oak (Quercus semecarpifolia) in a survey to rank wild fodder species. However, while they ranked banj oak first for its abundance and use, they gave it low scores for nutritional value and milk production value (Dhani Arya et al., 2011), an empirical assessment that has been confirmed by in vitro measurements. The overall conclusion is that banj oak is a low quality fodder that is preferably used under conditions of scarcity (Barman et al., 2008). In the Northern grasslands of Pakistan, a survey of 11 tree fodder species found that banj oak leaves had the lowest palatability in sheep (Sultan et al., 2008). In vitro DM and OM digestibilities of banj oak foliage have been found to be very low (36-45%, Barman et al., 2008; Singh et al., 2005; Sultan et al., 2008), and similar to those of wheat straw or rice straw (Singh et al., 2005). In vitro OM digestibility and metabolizable energy (5.5 MJ/kg DM, gas method) of banj oak foliage were among the lowest in a comparison of 12 fodders in the Indian Himalayas (Singh et al., 2005), and in a comparison of 11 fodder tree leaves from the Northern grasslands of Pakistan (Sultan et al., 2008). Despite their poor nutritional value, banj oak leaves have been used efficiently as a protein supplement in low quality diets. When banj oak leaves were used to supplement grass hay in bull diets, increasing the inclusion of leaves at up to 60% of the diet had a positive effect on feed intake and protein intake (Paswan et al., 2010). In growing cattle, supplementation of wheat straw with a concentrate and banj oak leaves (39:31:30 ratio) resulted in a higher feed intake (+ 41% DMI), higher DM, OM and NDF digestibilities (52, 55 and 49%, respectively) and a higher ME intake (+ 17%). Including banj oak leaves at 30% in a wheat straw-based diet increased N retention and body weight gain (Sharma et al., 2008). Feeding banj oak leaves to growing cattle as 33 or 65% of the diet decreased their parasitic load (Sahoo et al., 2004).